Home Corporate Crowd How Great is the Great Indian IT Industry? How Great is the Great Indian IT Industry? What terms resonate in your mind when you hear the words Apple, Google and Microsoft? If you leave out the names of the founders the most likely responses will be iPod, iPad, iPhone, Windows, XBox, Microsoft Office, Google Search, Gmail, Chrome etc. Observe closely and you will realize that all of these are cutting edge technology product solutions. As a result the combined worth of these three brands today is close to $ 350 billion as per the latest financial results of these technology giants. Now lets switch the conversation and bring it into an Indian Context, the land which has given birth to the greatest software engineering minds that are powering many industry stalwarts in the technology space. 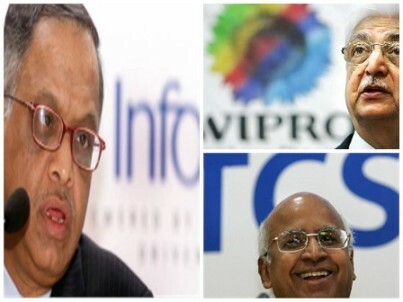 What terms resonate in your mind when you hear the words TCS, Infosys and Wipro? This time if you leave out the names of the founders, you would be left almost blank. Perhaps at best some of the responses would be outsourcing, Bangalore, H1-B and it support. As a result, even though these Technology giants employ millions of people across India their combined worth is nowhere close to any of the top 10 American technology companies. The reason is quite simple, none of these three firms have any noticeable technology products associated with them. How then can one visualize Indian being a superpower in the next few decades (or 2020, if APJ Abdul Kalam is to be believed, see here). As NR Naryana Murthy retires from Infosys as Chairman of the Board, a thought came to my head. NRN and the other stalwarts of the industry (Premji, Ramadorai, Raju etc) may have contributed a lot to getting India on the world map of IT providers, but in a way all of them were very bad at investing their profits in developing the IT products landscape. Whatâ€™s more they were so busy in ensuring they remain the poster boys of the stock markets that they did not even contribute to the development of the entrepreneurial landscape, to build product centric companies. What do we harp about, when we talk about the great Indian IT Industry? Did the great Indian IT industry lack the talent to invent, innovate and deliver? There was never any shortage of funds for sure. In the year 2000, Infosys had incubated Onscan, a wireless enabled Web notification product company started by two Infoscions. Today OnMobile (OnScan changed its name to OnMobile) is Indiaâ€™s only listed player in the Telecom VAS space, with $ 100 million in revenue. Sadly OnMobile seems like the only instance of such incubation. There could have been many more OnMobileâ€™s that India could have seen. Why single out Infosys, even NASSCOM, has done very little to empower companies with a product focus and create what could have been Indiaâ€™s product success stories. To me that is the one aspect of the Corporate Social Responsibility which is never considered. CSR does not only mean charity and uplifting the down trodden. That is something anyone can do. Creating new product opportunities and companies is something only the stalwarts can do or could have done. Sadly they are all gone or will be retiring soon, leaving no poster boys of the Indian IT product landscape. Note: The author is a Serial Entrepreneur pioneering in technology product innovation in the Internet and Media space. He is also a former Infoscion who worked with the company for five years till 2005. The real problem about Infy, TCS, Wipro is the lack of engineers. These companies don’t do engineering and thus don’t need engineers. Read this article http://blog.susam.in/2011/05/infosys-tcs-or-wipro.html for more insights. Could you cite the source of your Amazon Tweet? Very true, but. Nobody is interested in developing products as long as the money flows in. The combined worth of TCS, Infosys and Wipro is nowhere close to any one of the top 10 global Technology corporation. Keeping the phofit graphs continuous has taken prioirty. Products focus shoudl get more light and resources.